Are you ever just in the mood to get in the kitchen & bake? On Friday I had an intense urge to do just that. I swear, there's nothing like turning on some music, flipping on the oven & putting some serious love into what you're baking. We had plans to BBQ on Sunday with friends & I also had a lunch date with a girlfriend for her birthday on Saturday. So, I think instantly my mind goes to a baking as gift giving & I just love sharing goodies with friends. Especially when I can share something sweet, delicious & also healthy! I adapted this recipe from Flame To Fork when I wasn't eating eggs due to a leaky gut issue. 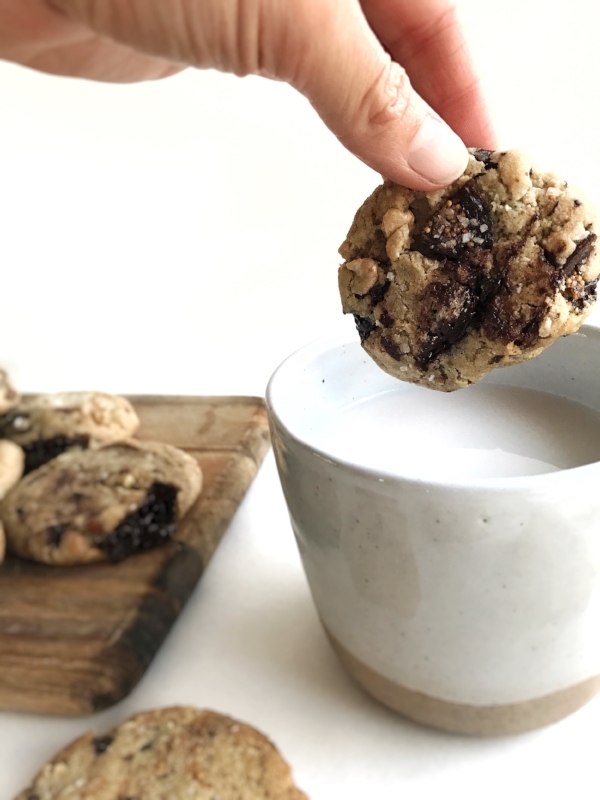 I was in desperate need for a chocolate chip cookie that was low in sugar, grain free & of course egg-less when I stumbled across their recipe. Gelatin instead of eggs?! Genius, why didn't I think of that sooner? & I was in luck because I had just stocked up on some Vital Proteins Gelatin. It was a match made in heaven! Preheat your oven to 350 & line a baking sheet with parchment paper. In a medium sized bowl add melted coconut oil, maple syrup & vanilla. Whisk until really well combined. In a large bowl combine almond flour, Gelatin, baking soda, & salt. Pour your wet ingredients in with your dry & fold together. Add in the nuts, coconut, figs & chocolate. Mix together with the back of your spoon or hands until everything is evenly distributed. The dough should be a little sticky but not enough to stick to your hands. Pop the dough in the fridge for 10 minutes. Take out & roll dough in to 1 inch balls. Place on baking sheet an inch apart & press down a bit with your hand. Sprinkle with coarse sea salt. Bake in the oven for 12-15 minutes or until perfectly golden brown & your house smells like heaven.